The Grand Palladium Palace Resort Spa & Casino is on the seashore of the famous Bavaro Beach in Punta Cana and is surrounded in an exotic landscape with lush palm tree plantations. All 410 guest rooms boast fireplaces and whirlpool tubs, furnished balconies, plus free WiFi and flat screen TVs with satellite channels. Dine on delicious cuisine throughout the resort with over 8 restaurants to choose from. The endless daytime activities ensure there is something for everyone. Get active in the ocean while windsurfing, snorkel in the crystal clear water, or book a massage or spa treatment at the wellness center. 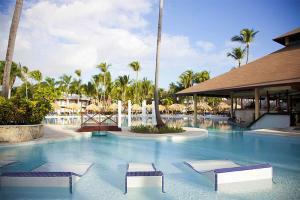 The resort is 10 miles from Punta Cana Airport, and 35 miles from La Romana International Airport.